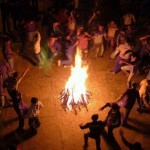 The first day of the three day festival Sankranti is known as Bhogi. Bhogi of this year will be celebrated on Thursday, 14th January 2016. Bhogi marks the start of the harvest festival of Sankranti. 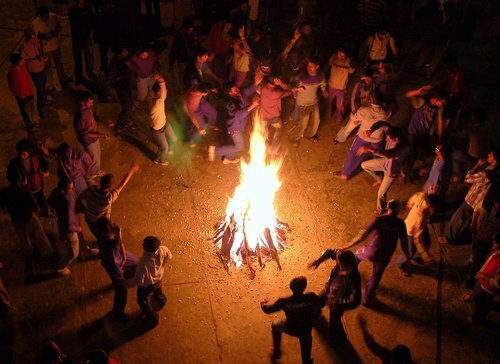 A camp fire which is lit using the old items, clothes and old furniture is a ritual of Bhogi. All the members of the family along with relative sit around the fire and enjoy the warmth of the fire in the cold winter of January. Rangolis, which are big in size are drawn in front of the house. In the middle of the Rangolis, Gobbemmalu (made of Cow dung) are placed and worshipped. These Gobbemmalu are believed to be Goddess Laxmi. Children are showered with bear fruits or Regi Pallu in the evening of Bhogi. It is believed that by showering Regi Pallu on Bhogi the evil on the children would be cast away and no evil could reach the children. From Bhogi kite flying is started.